Photos by Jim Muchlinski Yvonne Caron (right) and Shirley Stensrud served as Belgian cookie bakers for the Armchair Adventure trip to Belgium at Boulder Estates. They took part in an “armchair adventure” that gave everyone a firsthand view of Belgium. It was complete with detailed information about Belgian history, architecture, food, beverages and culture. Boulder Estates Tenant Services Director Jan Mason said the program about Belgium was the latest in a monthly set of Amrchair Adventures that have featured different countries each month in 2018. An important part of the program was a display of family heirlooms that have been kept through at least several generations. Boulder Estates resident Frank DeSleer talked about a pair of twin vases that were brought to America when his ancestors arrived as immigrants. He bought them in order to keep them as part of his family. 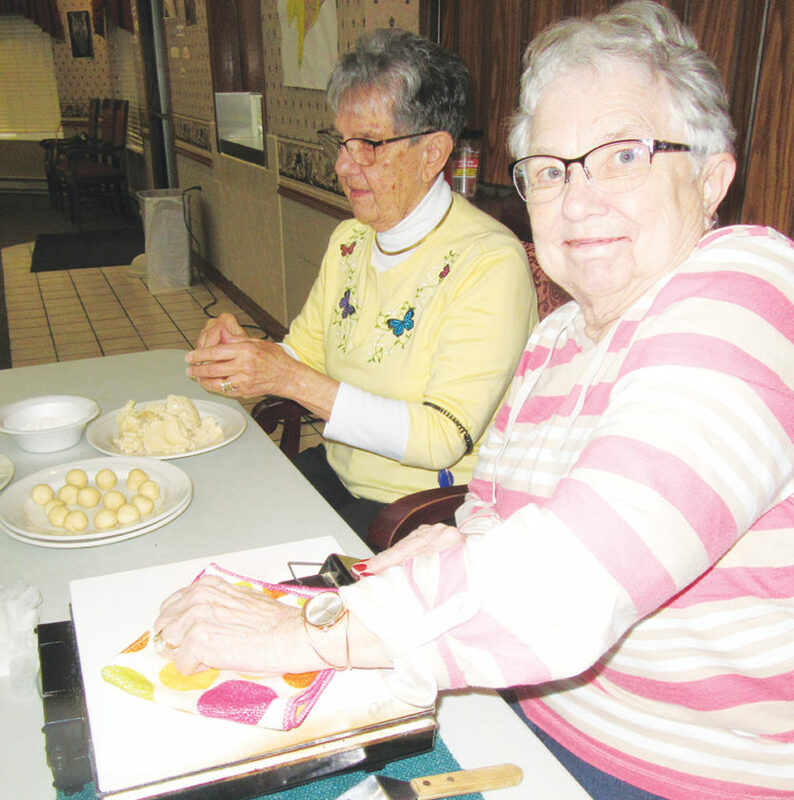 Yvonne Caron of Taunton was one of two honorary Belgian cookie bakers for the Armchair Adventure along with Boulder Estates resident Shirley Stensrud. Caron is a volunteer at Boulder Estates through Lutheran Social Services. At age 77, she makes cookies with a modified waffle iron after many years of experience with the more time consuming traditional Belgian iron that was held over a hot stove. Caron also grew up in a family that spoke the Flemish Belgian language at home. It is one of three different languages spoken in 21st century Belgium, along with French and German. Another heirloom exhibit item displayed by Boulder Estates resident Delores Manke was an art work of handmade lace. It was made from a parachute used in the Battle of the Bulge of 1944 and 1945, a last effort by Nazi Germany to stop an Allied advance across the European continent.The woman who made the lace artwork gave it to Manke’s husband with thanks for how the United States saved Belgium. Everyone in the audience, which totaled more than 50 people, enjoyed samples of rich Belgian chocolate and flavorful specialty beers. The Brussels airport features the largest selling chocolate shop in the world. The country’s beer industry dates back to “abbey beers” brewed by monks in medieval monasteries. It now includes 150 breweries with a wide variety of beer brands, all of which are served in their own monogrammed beer glasses. Mason and activities assistants Sue Jants and Michelle Murphy provided many additional facts about the Belgian way of life. The audience learned that Roman emperor Julius Caesar named Belgium based on an ancient European tribe that lived in an area between Gaul and Germania. One of its cities, Antwerp, has been a worldwide diamond capital for more than 500 years. About 84 percent of all the rough diamonds in the world pass through Antwerp on their way to being precision cut for high-quality jewelry. The baseball-like game of cricket, most often associated with Great Britain, has its roots in Belgium. Originally called wickets, it was played by shepherds next to their flocks of sheep. The earliest cricket bats were shepherd sticks used to herd the sheep as needed. Belgium is the headquarters of the European Union and has more medieval castles per square mile than any country in the world. Voting is mandated by a law that is enforced by Belgian authorities and which could be grounds for imprisonment if it isn’t obeyed.